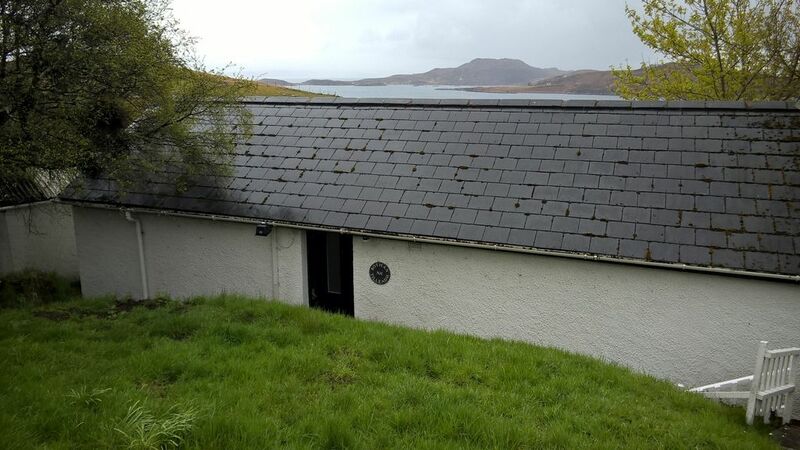 Very peaceful, small, one-bedroom cottage with sea views down the croft across to the largest of the Summer Isles, Tanera Mor, and the Hebrides. In quiet Highland hamlet with spectacular coastal and mountain scenery on every side. The Bothan is perfect for a couple or a family with young children looking for a few, quiet days away but still with facilities such as satellite TV and the Internet. Double-bed or two single beds as required in the bedroom. Double sofa-bed in the living room, plus a single fold-down bed and baby-cot available. The cottage itself was fine. The location is great. We had dogs and it was the first garden (We have been staying all over Scotland) that they def couldn't go in unless they were on a lead which was a slight pain but worth it for the area. It felt like coming home when we returned each evening. Stayed for two weeks. Not fitted out like a poncey show home, but everything was functional and to hand. Had more than just essentials. You didn't have to look hard to find things as they were intuitively placed. A great place to make your base for excursions into the surrounding splendid countryside. A bonus was that it was in a midge-free area. It was well managed by the owner who lived next door. Very relaxing place in great countryside. Ian is a very welcoming host. The cottage had a very relaxing feel and is very comfortable. The views from the cottage are fantastic. If you are looking for a quiet holiday in a remote location (nearest pub and shop are about 40 mins walk and mobile reception is patchy) then this is the place for you. We had a wonderful two weeks there. The cottage was well equipped and cozy. A great place to base yourself for a week of exploring the area. The Summer Isles Hotel in Achiltibuie has fantastic meals and the Fish Pie is recommended. The cottage had everything we needed but the comfort of the bed and the lounge were not to our liking. Un excellent séjour dans une maison très agréable! Une région magnifique et une maison parfaitement équipée, proche de promenades à pied ou plus loin en voiture, dans un paysage changeant suivant le temps mais toujours beau. Nous sommes repartis pleins de souvenirs formidables et serions volontiers restés beaucoup plus longtemps. Take the motorways as far as the edge of the Highlands, then the A9 to Inverness. From Inverness follow the signs to Ullapool and from there to Lochinver and the north. Ten miles out of Ullapool turn left onto the single-track road to the Coigach Peninsula, Achiltibuie and Polbain. Down-payment and balance requested. Prices based on two adults. Key pick up with owner. Discount depending on length of stay. Rate depending on the number of persons and whether they are children. Children under 7 FOC. Children aged under 17 and 7 and over - 1/2 of additional adult rate of £42, £63, £75 depending on season. Please contact us for final price.